Isabella II was the eldest daughter of Ferdinand VII, and of his fourth wife, Maria Christina. 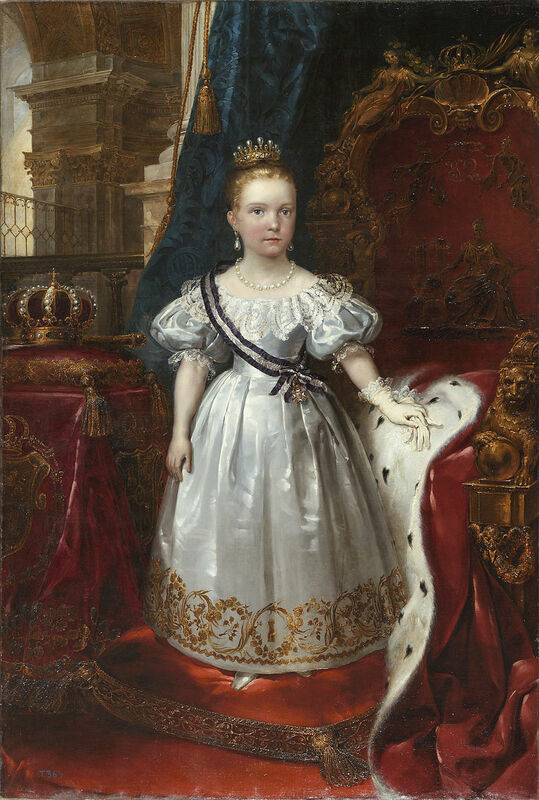 Maria Christina became queen-regent in 1833 when her daughter, at the age of three years, was proclaimed on the death of the king. Ferdinand VII forced the Cortes to revoke the Salic law, introduced by the Bourbons at the beginning of the 18th century and to re-establish the older succession law of Spain. The brother of Ferdinand, Don Carlos fought seven years, during the minority of Isabella, to dispute her title. Supporters of Don Carlos and his descendants were known as Carlists (Carlistas). 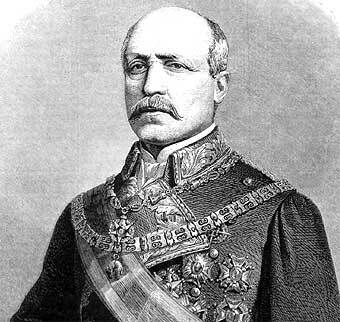 There were several Carlist wars along the 19th century and the first one ended in 1839 with an agreement between generals Espartero, leader of the Isabelline army, and Maroto, leader of the carlist army. After the Abrazo of Vergara Isabella II minority started. Isabella’s rights were only maintained through the support of the army, the Cortes and the Liberals and Progressists. At the same time, it was established a constitutional and parliamentary government, the religious orders were dissolved ant their properties, confiscated and finances were modernized. After the Carlist war the queen-regent, Christina, resigned to make way for Espartero, the most successful and most popular general of the Isabelline armies, who only remained regent two years. He was deposed in 1843 by a military and political pronunciamiento, led by Generals O’Donnell and Narvaez . Narvaez lead a government which induced the Cortes to declare Isabella of age at thirteen. 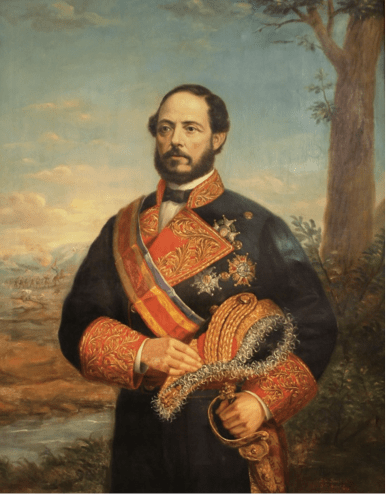 Three years later the Moderado party and made their queen marry, at sixteen, her cousin, Prince Maria Fernando Francisco de Asis de Bourbon . Isabella reigned from 1846 to 1868, and that period was one long succession military pronunciamientos: the Moderado Party ruled from 1846 to 1854, Progressists from 1854 to 1856 and the Union Liberal from 1856 to 1863; Moderados and Union Liberal quicklysucceeding each other and keeping out the Progressists away from government. This led to the revolution of 1868. Queen Isabella II went into exile at the end of September 1868, after her Moderado generals had oppossed little resistance at the battle of Alcolea by generals Serrano and Prim. One of the most positive achievements of Queen Isabella’s reign were the war against Morocco, which ended in an advantageous treaty and some cession of territory; some progress in public works, especially railways and a slight improvement in commerce and finance. Isabella was induced to abdicate after the triumph of the Glorious Revolution in 1868.